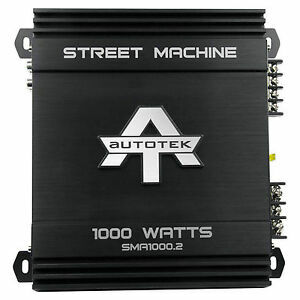 Autotek SMA1000.2 Car Audio Amplifier. Bridged 4 ohms: 1000 watts x 1 chan. Number Of Channels 2. Country/Region of Manufacture United States. Manufacturer Part Number SMA1000.2. Useful Links. Variable low-pass filter: 30 - 250 Hz, 12 dB/octave. Le paiement immédiat de 134,35 EUR est obligatoire.